Here is Mister Rattlesnake #1 for the trip. He was stretched out by the water trail on Bob Bald and he was very loud and agitated. Don't mess with me!! MORNING ON THE BMT AT SNOW CAMP: Early morning before dawn comes to me as I wait for first light and a gear up to gain the highest ground where the green grass sprouts and the open fields call with the sound of the Raven's Yell. Ok, I am on Four Mile Ridge and I left Snow Camp at 9 am and 30 minutes later sit at the Bob tee leaning up against the new trail sign depicting not the BMT but showing the Bob trail #54 going east and the Fodderstack #95 going north and down. I will soon be ready to continue by backpacking journey over the Bald, Raven Lid, get water and spend all day hiking the high country. It was a special surprise to see Ken Jones as we seem to run into each other often. The last time was at the BMT Grand Opening on July 16 and he was busy that day lecturing to a large crowd of trail enthusiasts of which I count myself as one. The Bob! 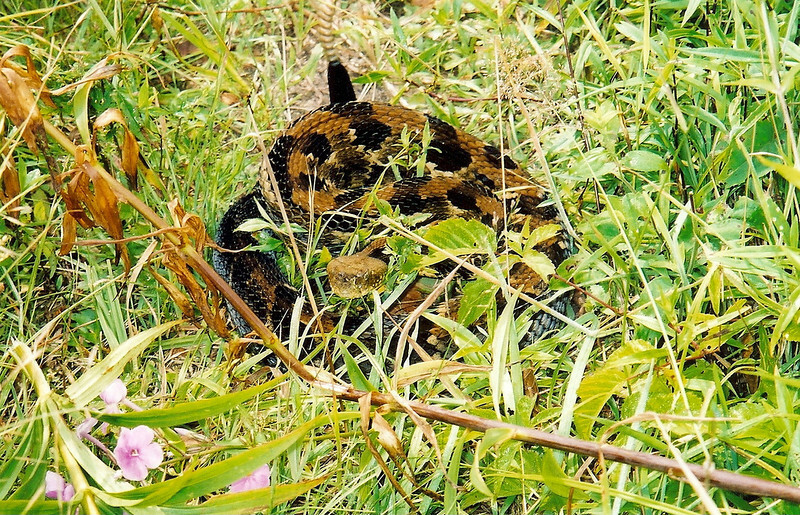 As I was walking down the trail to the spring I came upon a big eastern diamondback RATTLESNAKE on the trail and stomping my feet I got her to rattle away with vigor. I needed water so I waited her out though as it coiled to strike I wisely kept my distance and after taking fotogs she slinked away and I had a real hard time walking on the trail where she once sat. With water in hand I now sit up on the grassy spot waiting to move and sobered by her presence. I must keep my beady eyes open more now than ever. She smelled me and saw me and probably heard me talking to her and so she lives and I saved her from the usual fear filled testosterone redneck so common in these woods. Does she owe me one? Well, let's just say she can tell her relatives and friends that I'm okay and to leave me alone. The wild red phlox is in bloom and covers the bald with its beauty and in this garden of eden is the serpent, the most beautiful thing of all. Let's load up and tiptoe to the Gap. Here I sit before the gap at Camp Mandingo enjoying the feel of this special spot. OVERNIGHT AT SADDLE TREE AND THE HANGOVER: This is a new camp for me in the big site below the small site near the Hangover rocks. Clouds are moving in and it looks like some storms might be headed my way, let's hope the ground stays clear of lake affect and all else is good. Ok, night comes to the Hangover but not yet the rain, so I sit up on the thermy penning this trail report and waiting to rehang the food bags, brush and floss, light a stick of incense and prepare to call it a day.